Always meant to see this, and it played once a week for like a month on Much Music last year... caught bits and pieces, but never had time to sit down and watch the whole thing. Now I'll have to. I think part of my reluctance has been that every time I see an interview or soundbite or quote from anyone from the band they come across as, well, once-great-now-mediocre-middle-aged-self-important-multi-millionaire-blowhards. Self-important-multi-millionaire-blowhards, also known as the Lars effect. He's in full pompous mode most of the time. It's actually very interesting, and pretty long too. I've never heard the perspective from someone who can't stand the music though, other than the many old reviewers. It's surprisingly personal, especially with the songwriting process, where they let you see them throw around some pretty mediocre ideas. Lot's of in-fighting as well, and after the first half hour you'll be waiting for them to finally lose it on their group therapist. Unfortunately, they never get around to firing Bob Rock (spoiler). Being a fly-on-the-wall during their creative process alone would be worth the price of admission for me. Most people assume that creative genius comes easy to guys like that, and I guess it does for some. Supposedly Bono can knock off an album's worth of songs over breakfast. But more often than not it's being willing to do the hard work of slogging through, and past, mediocre ideas, willing to discard them altogether if necessary. But in their dotage the Metallica crew seems to be content with polishing turds. But I guess I have no right to disparage, I haven't actually paid attention since the Black album. 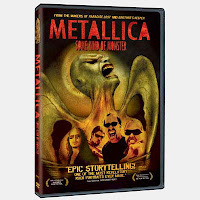 Agreed, some of the ego stuff is hard to watch, but the style of the film is so intimate that it was easier for me to empathize than I expected, especially with Hetfield. He says some things that really resonated with me, and I found his character very compelling. Lars has always been a blowhard, so you get what you expect there. Even he was interesting, though. Plett, I also found the creative-process stuff in the studio fascinating. It had the effect of pulling back the curtain on the Great Oz, because like you say, most of what they're doing is mediocre at best. And I think that's generally true of most creative process -- you have to be willing to hash through hundreds of ideas to find the good ones. They're obviously working their asses off in the studio, making themselves vulnerable, giving and taking criticism...it's all so loaded. I might have said that it was too long, but I watched it over three nights and ended up going through all of the extra scenes on the DVD, so I can't really complain.